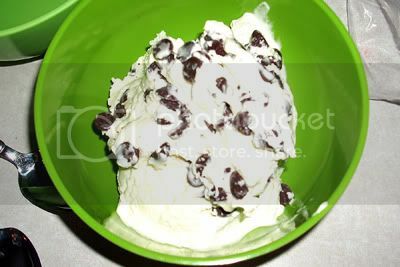 Recently my bloggy-friend Amanda showed people how you can make homemade ice cream without using an ice cream freezer. 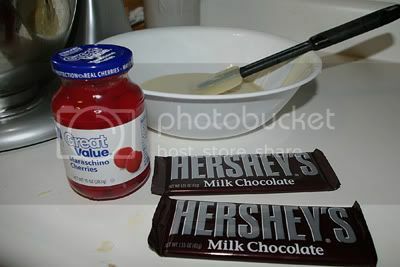 It all stems around Eagle Brand Sweetened Condensed Milk. First - start with two cups (16 oz.) 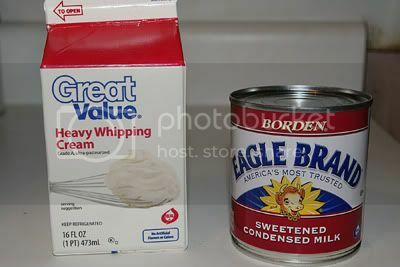 of heavy whipping cream and one can of Eagle Brand Sweetened Condensed Milk. 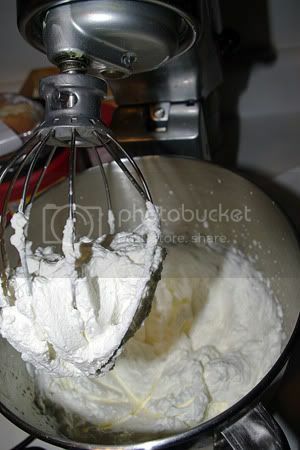 Next, whip the whipping cream into "stiff peaks." Don't whip it too much, you might end up with butter! 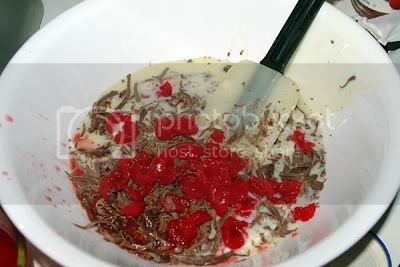 Then add your mix-ins (in this case grated chocolate bars and chopped up cherries) to the sweetened condensed milk. 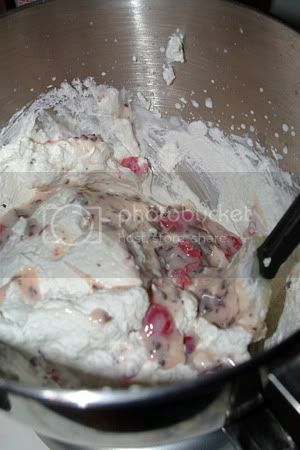 After the mix-ins are mixed in well...."fold" the mixture into the heavy whipping cream. Note: As my friend Kim told me, "fold" gently, not "stir" it in! 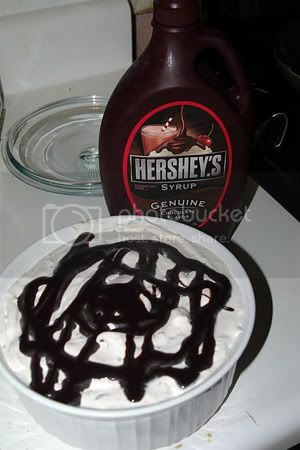 Finally, pour the completed mixture into a container you can place in the freezer.As an added bonus, I topped it with chocolate syrup. 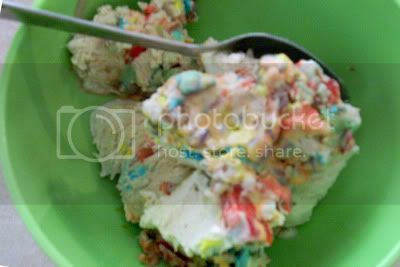 Note: We learned this by trial and error... it was easier to freeze the ice cream in a plastic container rather than a glass container. Follow steps above and freeze. It takes AT LEAST five hours (or overnight) to have the ice cream set up. Note: This ice cream is REALLY rich. A little bit, went a LONG way! It set up better in the plastic container, rather than the glass container. After we made the first batch, I found this variation on the Eagle Brand website. For the chocolate, we tried one bag of mini M&M's. Note: You definitely want to use mini M&M's, so you aren't biting into huge frozen pieces of chocolate. Note: We we didn't have measuring spoons at the lake, so we "eyeballed" the extract (using the bottle caps) and well, we just added the chocolate chips to our desired consistency. We decided mini-chocolate chips would have made it better. 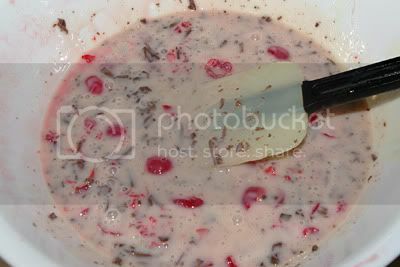 So there it is, homemade ice cream that only needs a container to freeze it, and a mixer of some kind. 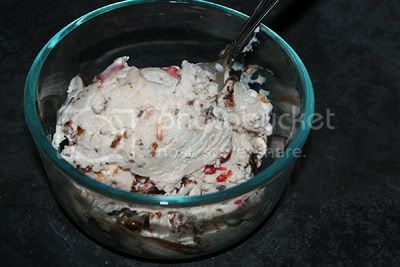 I love that you can add a variety of "mix-ins" to make several different yummy ice creams. Want to read Amanda's yummy post - that inspired all of this? Click HERE. Visit Eagle Brand's Website for more ideas HERE.